The Jewish people believe their history as a nation begins with Abraham. The story of Abraham in the Torah begins when God tells Abraham to leave his country. He promises Abraham and his descendants a new home in the land of Canaan. This is now known as the Land of Israel. It is named after Abraham's grandson, Jacob, who was also called Israel and who was the father of the twelve tribes. This is where the name “Land of Israel” comes from. The land is also called “the Promised Land” because in the Torah, God promises to give the land to the children of Abraham (Gen 12:7, Gen 13:15, Gen 15:18, Gen 17:8). Jews believe that to know what God wants them to do, they must study the books of Torah and its laws and do what they teach. These include both laws about how to behave to other people and how to serve God. The two most important groups of books in Judaism are the Bible and the Talmud. The beliefs and actions of Judaism come from these books. Jewish teachers and scholars wrote more books, called commentaries. They explain and say more about what is written in the Bible and Talmud. The Torah is the most important of all Jewish writings. The first five books of the Hebrew Bible (known to Christians as the "Old Testament") make up the Torah. The Torah contains the basic laws of Judaism and describes the history of the Jews until the death of Moses. Jewish tradition says that God told Moses what to write in the Torah, which is also called the Five Books of Moses. Religious Jews believe that Moses brought the Ten Commandments and the Torah down from Mount Sinai. The Ten Commandments are special because they were heard by all of the Jewish people at Mount Sinai. However, in traditional Judaism, all of the 613 mitzvot in the Torah are equally important. Jews divide the Hebrew Bible into three parts and call it the Tanakh. The three parts are the Torah, which is the first five books; the Nevi'im, which are the books of the prophets; and the Ketuvim, meaning the Writings, which are other books of history and moral teachings. Rabbinic Jews also believe that there is another part of the Torah besides the 5 books of Moses. It is called the Mishnah, also called the Oral Torah or Oral Law. It explains how to follow the laws written in the 5 books. There is a commentary (explanation) of the Mishnah, called the Gemara. Together, the Mishna and the Gemara make up the Talmud. Karaite Jews however believe that there is no additional Torah besides the 5 books of Moses. Traditional Jews believe that God gave the written Torah and the oral Torah to Moses and that Moses told it to the Jewish people, and that it is the same today as it was back then. Traditional Jews also believe that all of the commandments must still be followed today. Liberal Jews believe that the Torah was inspired by God but written by human beings. Liberal Jews believe that all of the ethical laws in the Torah must still be followed, but many ritual laws do not need to be followed today. It is considered good in Judaism to talk about the commandments and to try to understand how to follow them. The Talmud has many stories about Rabbis who argued about the commandments. Over time, some opinions have become the rule for everyone. Some rules are still being argued about. Jews praise logical argument and looking for truth. There is no single leader of Judaism who can decide how to follow the commandments or what to believe. Even though Jews believe different things and they disagree about the rules, they are still one religion and one people. Jews who follow the religious rules called "kashrut" only eat some types of food that are prepared by special rules. Food that a Jew can eat is called kosher food. Traditional Jews are very careful about kashrut. They usually cannot eat many foods in non-kosher restaurants or in the home of someone who does not keep kosher. Sometimes, this makes it hard to visit people or to do business. It is important to understand that this is part of their religion. People help avoid this problem by choosing to dine with Traditional Jews in a kosher restaurant or serve them kosher food in their home. Liberal Jews are not so careful about kosher, although some of them may keep some rules. Jews can eat any fresh fruit or vegetables that do not have any insects on or in them. Jews can eat any fish that has scales and fins. This includes fish like salmon and tuna. They cannot eat seafood like shrimp, lobster, or mussels. Jews can eat meat of any animal that chews its cud (food which has already been partly digested), and has split hooves. For example, cows, sheep, deer, and goats. However to be kosher it must be slaughtered and prepared in a specific way. Jews can eat many common birds such as chickens and turkeys and duck. The birds must also be slaughtered and prepared in a specific way. Jews can't eat birds of prey, like vultures. Foods sold in stores or restaurants must be checked by a Jew who is an expert in Kashrut. The name for this person is "mashgiach," or kosher overseer. He makes sure that the kosher rules were kept. Foods bought at the store often have a symbol called a hechsher on them to tell the customer that the food have been checked. Many everyday foods have a hechsher. Honey is an insect product made by bees, but it is kosher. It is a well-known myth that kosher food must be blessed by a rabbi. Some call non-kosher foods "Treifah," meaning "torn." This is because the Torah says not to eat an animal that has been killed or torn by another animal. Jews cannot eat animals that do not have split hooves or animals that do not chew their cud. Unlike cows and sheep, pigs have split hooves, but do not chew their cud and are therefore not kosher. Jews cannot eat rodents, reptiles or amphibians. Jews cannot eat any sea animal that does not have scales and fins. For example, sharks, eels, crabs, shrimp and lobsters are not kosher. Jews cannot eat birds that eat meat like vultures, which are mentioned in a list in the Torah. Jews cannot eat any insects, except for a few types of crickets or locusts. There are other rules for kosher food as well. Animals must be killed in a certain way, including using a fast strike across the neck with a very sharp blade which makes sure that the animal dies quickly. All the blood must be removed from an animal before the meat is eaten. This is done by soaking and salting the meat. A Jew cannot eat a meal that has both meat and milk in it. This comes from the rule (in the Torah) that a Jew must not cook a young goat in its mother's milk. Because of this, Jews use separate dishes and utensils for foods that have meat in it, and foods that have milk in it. After eating meat, many Jews do not drink milk products before a time period between 1 to 6 hours has passed. Kosher food must be cooked in a kitchen for actual kosher food. If the kitchen has been used to cook non-kosher food, such as rabbit and pig then the kitchen must be cleaned in a special way before it can be used to cook kosher food. One of the commandments is to keep the Jewish Sabbath, or Shabbat. Shabbat starts every Friday at sunset and ends on Saturday at nightfall. Shabbat is a day of rest to thank God for making the universe. The tradition of resting on Shabbat comes from the Torah. According to the Torah, God created the world in six days and on the seventh day, Shabbat, He rested. Many Jews go to their temple or synagogue to pray on Shabbat. 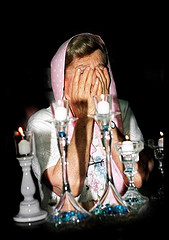 Traditional Jews are very careful about Shabbat. It is a special day. They clean their houses and prepare special food for Shabbat. They dress in their nicest clothes. They sing beautiful songs and say extra prayers in the synagogue. They have dinner and lunch with their families. Many families also invite guests for dinner and for lunch. They eat special delicious food, and sing together traditional Shabbat songs. On Shabbat afternoon people study Judaism together or just visit friends. Liberal Jews do not follow those rules. Some do go to synagogue, visit friends, or have special meals. But they may also talk on the phone, drive cars, and go shopping. Brit Mila (for boys) a circumcision ceremony when a boy is 8 days old. It includes naming the baby. Some non-Orthodox Jews practice Brit Shalom, a baby naming ceremony for Jewish boys without circumcision. Pidyon haben (for boys) is when a father does a special ceremony to redeem his wife's first son from the Temple, as originally all firstborn boys were sent to serve in the Temple. Levites (a tribe of Israel) and Cohanim (priests) do not do this ritual. Bat Mitzvah (for girls) a 'coming of age' ceremony when a girl turns 12 (13 for some Jews). Bat Mitzvah means "daughter of the mitvah" or "daughter of the commandments" in Hebrew. Once a girl turns 12 (or 13), she is considered a woman and is expected to follow Jewish law. A ceremony is not required. Bat Mitzvah not only refers to the ceremony, but also to the girl herself. Bar Mitzvah (for boys) a 'coming of age' ceremony when a boy turns 13. It includes reading the Torah and special prayers. Bar Mitzvah means "son of the mitzvah" or "son of the commandments" in Hebrew. Once a boy turns 13, he is considered a man and is expected to follow Jewish law. A ceremony is not required. Bar Mitzvah not only refers to the ceremony, but also to the boy himself. For a very long time, most Jews in Europe believed the same basic things about Judaism. Jews in other lands had different beliefs and customs than European Jews. About 200 years ago, a small group of Jews in Germany decided to stop believing in many parts of Judaism and try to become more "modern" and more like Germans. Those Jews were called Reform Jews. Today there are three main kinds of Judaism: Reform, Conservative, and Orthodox Judaism. There are also kinds with a smaller number of people, such as Reconstructionist Judaism, andKaraite Judaism. Each group has its own practices according to how it understands the Jewish laws. For example, Reform (also called Liberal or Progressive) Judaism encourages people to choose the ways to be Jewish that mean the most to them based on the traditions. Reform Judaism teaches Jews to focus on the ethical laws of Judaism. Conservative Judaism developed after Reform Judaism. The leaders of Conservative Judaism felt that Reform Judaism was too radical. They wanted to conserve (protect) Jewish tradition instead of reforming (changing) it. Orthodox Jews do not believe that Reform or Conservative Judaism are correct because they believe that the laws given by God are timeless, and can't be changed. In the most recent survey of Jews in the United States in 2000-2001, it was found that 35% of American Jews say they are Reform, 27% say they are Conservative, 10% say they are Orthodox, 2% say they are Reconstructionist and 25% do not say what type they are. In Israel, almost all Jews go to Orthodox synagogues. There are very few Reform or Conservative synagogues, but there has been a steady increase since 2009. In Israel, Jews do not call themselves Reform, Conservative, or Orthodox. Instead, they mostly call themselves "Haredi" (completely religious) "Dati" (basically religious), "Masorati" (traditional/conservative) or "Chiloni" (secular). Surveys suggest about 20% of Israelis say they are secular, 25% say they are Dati or Haredi and 55% say they are traditional. Names are very important in Judaism. Many Jews believe that a name not only tells you who someone is, but also tells you something about them. Names of God are very special in Judaism, so Jews do not write them or speak them fully but use other words instead. That is why some Jews write G-d, with a "-" instead of an "o." HaShem Means "The Name". It is the word Jews use most often when not praying to talk about God. Adonai means "My Lord." This name tells Jews about God's position. God is the King of the World, and his name Adonai lets us know that. Elohim means "one who is strong enough to do everything." This name is used when talking about God's power to create or God's justice. This tells us that God is the creator and that God rules the world with just laws. The two names above are so special that Orthodox Jews use these names only when they pray and read the Torah. When they are not praying or reading the Torah, they say "Hashem" (The Name) or "Elokim". God - Some Jews write "God" by replacing the "o" with a dash, like this: "G-d". They do this because God's name is very holy so they are not allowed to throw away a piece of paper with "God" written on it. However, if by accident "God" is written, then the paper can be disposed of in a special way and buried in a special place. Others say that "God" is just an English word, not Hebrew, and so it is not holy. YHWH ("Yehovah"/"Yahweh") is the most sacred name of God in Hebrew, and is not pronounced by most Jews. No one knows where the name came from, or what exactly it means. It looks like the Hebrew word "hayah," which is the verb "to be." (According to Hebrew scripture, when Moses asked God who God was, God told Moses I am that I am/I am who I am.) Jews believe that the name YHWH shows that God is endless. Instead of trying to say it, most Jews say "haShem", which means "The Name." Some people pronounce this name as Yahweh, or Jehovah. Scholars of religion sometimes refer to "YHWH" as the Tetragrammaton, from Greek words meaning "four letters". ↑ Birnbaum, Philip (1975). "Principles of Faith". A Book of Jewish Concepts. New York: Hebrew Publishing Company. pp. 50–51. ISBN 088482876X. ↑ Maimonides. "The Thirteen Principles". Retrieved 29 June 2007. ↑ 4.0 4.1 4.2 4.3 Mendes-Flohr, Paul (2006). "Judaism". In Riggs, Thomas. Encyclopedia of Religious Practices. 1: Religions and Denominations. Detroit: Gale. p. 423-453. ↑ Donin, Hayim Halevy (1972). "The Cornerstones of Judaism: Israel–Its God". To Be a Jew: A Guide to Jewish Observance in Contemporary Life. New York: Basic Books. pp. 18=23. ISBN 0465-08624-1. ↑ 6.0 6.1 6.2 6.3 Birnbaum, Philip (1975). "God (chapter)". A Book of Jewish Concepts. New York: Hebrew Publishing Company. p. 35. ISBN 088482876X. ↑ Neuser, Jacob; Avery-Peck, Alan (2003). The Blackwell Companion to Judaism. Blackwell. p. 3. ISBN 9781577180593. ↑ 8.0 8.1 Wilkinson, Philip (2008). "Judaism". Religions. New York: Metro Books. pp. 66–83. ISBN 978-1-4351-2132-4. ↑ Green, Arthur (2014). Judaism’s 10 Best Ideas. Woodstock, VT: Jewish Lights Publishing. pp. 9–17. ISBN 978-1-58023-803-8. ↑ Birnbaum, Philip (1975). "Reward and Punishment". A Book of Jewish Concepts. New York: Hebrew Publishing Company. p. 600. ISBN 088482876X. ↑ Greenberg, Irving. "The Covenant & God". My Jewish Learning. Retrieved 23 June 2014. ↑ Birnbaum, Philip (1975). "Attah Behartanu". A Book of Jewish Concepts. New York: Hebrew Publishing Company. pp. 70–72. ISBN 088482876X. ↑ Green, Arthur (2014). Judaism’s 10 Best Ideas. Woodstock, VT: Jewish Lights Publishing. pp. 29–35. ISBN 978-1-58023-803-8. ↑ "Tikkun Olam: Repairing the World". My Jewish Learning. Retrieved 23 June 2014. ↑ Birnbaum, Philip (1975). "Proselytes". A Book of Jewish Concepts. New York: Hebrew Publishing Company. pp. 132–134. ISBN 088482876X. ↑ Tracey Rich. "A List of the 613 Mitzvot (Commandments)". Retrieved 2007-06-29. ↑ 17.0 17.1 Birnbaum, Philip (1975). "Mitzvah". A Book of Jewish Concepts. New York: Hebrew Publishing Company. pp. 390–391. ISBN 088482876X. ↑ Green, Arthur (2014). Judaism’s 10 Best Ideas. Woodstock, VT: Jewish Lights Publishing. pp. 3–8. ISBN 978-1-58023-803-8. ↑ 19.0 19.1 19.2 19.3 Rich, Tracey. "The Land of Israel". Judaism 101. Retrieved 23 June 2014. ↑ Schweid, Eliezer. "Significance of the Land of Israel in the Bible". My Jewish Learning. ↑ Blidstein, Gerald Y. (2007). "Even Shetiyyah". Encyclopaedia Judaica, Vol. 6 (2nd ed.). Thomson Gale. pp. 574–575. ↑ Birnbaum, Philip (1975). "Eretz Yisrael". A Book of Jewish Concepts. New York Company: Hebrew Publishing Company. pp. 62–66. ISBN 088482876X. ↑ Donin, Hayim Halevy (1972). "The Cornerstones of Judaism: Israel–Its Land". To Be a Jew: A Guide to Jewish Observance in Contemporary Life. New York: Basic Books. pp. 12=18. ISBN 0465-08624-1. ↑ 24.0 24.1 Birnbaum, Philip (1975). "Messiah". A Book of Jewish Concepts. New York: Hebrew Publishing Company. p. 600. ISBN 088482876X. ↑ Tracey Rich. "Kashrut: Jewish Dietary Laws". Retrieved 2007-06-29. Wikimedia Commons has media related to Judaism. The Jewish History Resource Center Project of the Dinur Center for Research in Jewish History; The Hebrew University of Jerusalem. Askmoses.com: Orthodox Judaism site that explains a lot of the basics of Judaism. The complete formatted Talmud online. Interpretative videos for each page from an Orthodox viewpoint are provided in French, English, Yiddish and Hebrew.